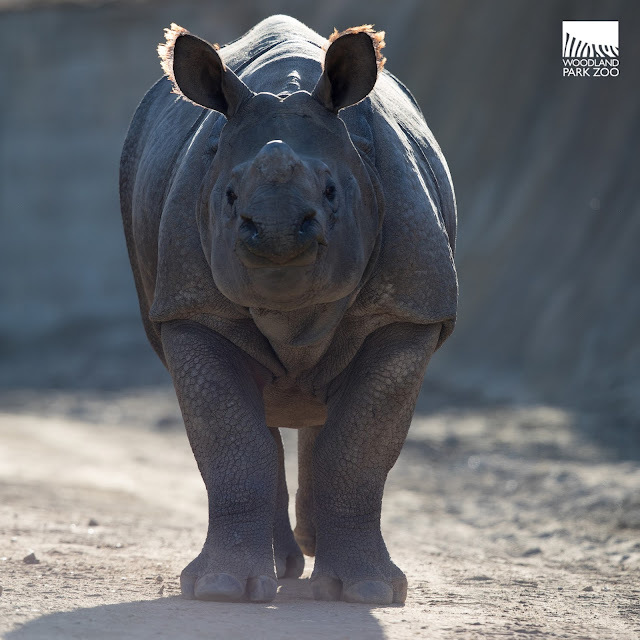 The first of two rhinos has arrived safely at Woodland Park Zoo. After a road trip from San Diego, Taj, a 17-month-old male greater one-horned rhino, arrived last Friday in healthy condition. Trained in preparation for the move, Taj traveled in a custom-made trailer driven by an expert who specializes in moving rhinos. Taj will live at Assam Rhino Reserve which opens May 5! Pronounced like Taj Mahal, Taj means “crown” or “jewel” in Hindi. 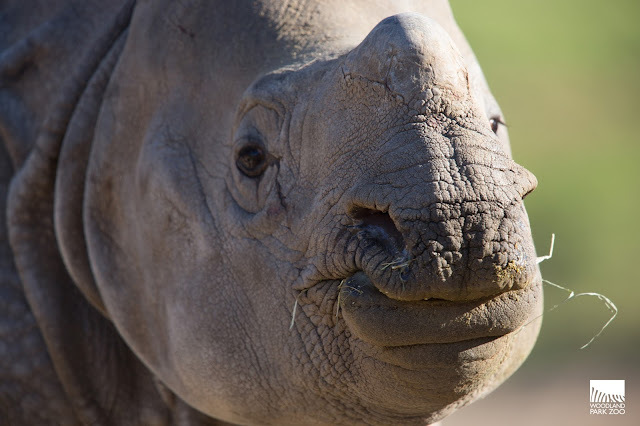 He was born Nov. 10, 2016 at San Diego Zoo Safari Park and is the 70th greater one-horned rhino born at the Safari Park since 1972, making the Park the foremost breeding facility in the world for this rhino species. Taj is already settling in and getting to know his animal keepers. “Taj has spent his first few days inside the barn settling in and becoming familiar with his new surroundings and rhino care keepers. Starting this week, we will begin introducing him to the outdoor exhibit yards where he will also be in standard quarantine,” says Martin Ramirez, mammal curator at Woodland Park Zoo. He will be off view to guests until the exhibit opens on May 5. Taj is a young greater one-horned rhino. At 17-months-old he is just a lightweight, only 1,500 lbs. Assam Rhino Reserve will showcase greater one-horned rhinos, Asian brown tortoises and demoiselle cranes. Rhinos are iconic symbols of the wildlife trafficking crisis. The exhibit will highlight the amazing adaptations of these three species and bring to life the impact of poaching, the illegal wildlife trade and the turtle extinction crisis. Taj will soon be joined by another male rhino, Glenn. Glenn was born a day apart from Taj on Nov. 11, 2016 at The Wilds, a 10,000-acre conservation center and safari park located in Cumberland, Ohio and operated by the Columbus Zoo and Aquarium. He was named in honor of the late astronaut and Senator John Glenn, who was a dear friend of the Ohio conservation organization. Hey buddy. We are thrilled to welcome rhinos to Woodland Park Zoo! 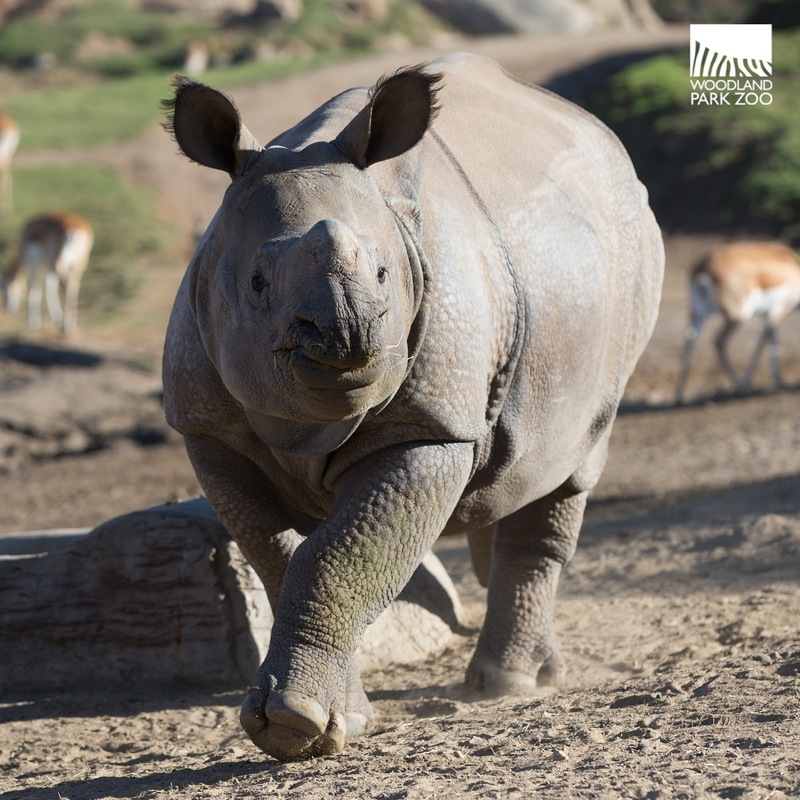 Currently weighing in at only 1,500 pounds apiece, the juvenile rhinos are still growing and will soon weigh between 4,000 and 5,000 pounds when fully grown. Taj and Glenn will be 18 months old when they make their debut. This age is typically when rhino calves separate from their mothers. “Through the Species Survival Plan for greater one-horned rhinos, we are playing a supporting role by providing a home for these young males who are not ready to start families yet.”says Ramirez. The Association of Zoos & Aquariums’ Species Survival Plans are conservation breeding programs across accredited zoos to help ensure healthy, self-sustaining populations of threatened and endangered species. 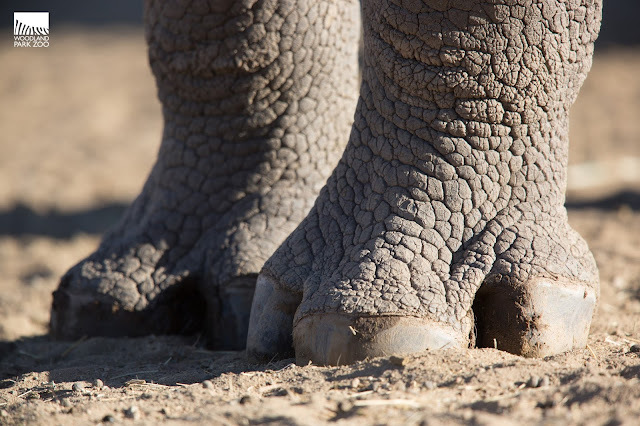 Take a stand to protect rhinos like Taj. Follow #RhinoLookout this summer to learn more about how you can take conservation action on behalf of these precious animals. You will see many natural behaviors of this water-loving species including wallowing in mud, grazing on land, immersing in a shallow pool and nibbling on aquatic plants along the edge of the pool. The young rhinos will have access to various yards and a wading pool. “Seeing, smelling, and hearing rhinos, turtles, and cranes will offer an extraordinary and rare experience for our community,” adds Ramirez. Assam Rhino Reserve was made possible by private donations of all sizes from generous individuals, families, corporations and foundations, as well as funding from the Seattle Park District. 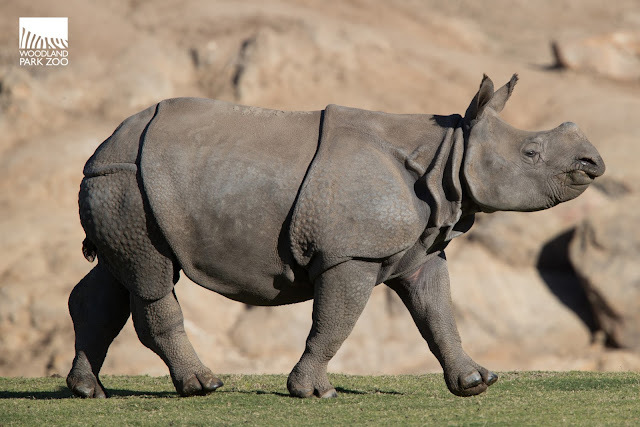 Also known as the Indian rhino, the greater one-horned is second in size only to African white rhinos. These incredible animals have single horn that is about 8 to 25 inches long; a gray-brown hide with skin folds giving them an armor-plated appearance. Once found across the entire northern part of the Indian subcontinent, the population rapidly declined to fewer than 200 in the 20th century due to sport hunting, human conflict, poaching for their horns for use in traditional medicine and habitat loss. According to the International Rhino Foundation, the population has recovered today to an estimated 3,600 thanks to conservation efforts and strict protection from Indian and Nepalese wildlife authorities and collaborative efforts of NGOs. The species lives in north-eastern India and southern Nepal and, while it is a successful conservation story, the pressures of poaching remain high. “With Assam Rhino Reserve, we want our guests to do more than see rhinos at the zoo. We want them to look out for them,” says Ramirez. Follow #RhinoLookout for information on how to support rhino care at the zoo and fund efforts to protect and defend rhino habitat from poachers. 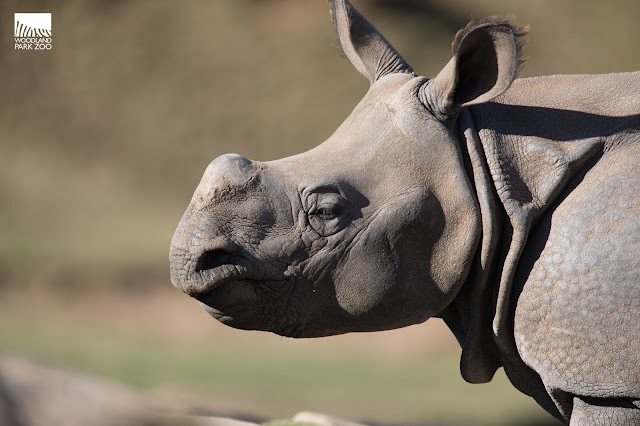 Woodland Park Zoo supports the International Rhino Foundation’s Indian Rhino Vision 2020 project, which aims to see a wild population of at least 3,000 greater one-horned rhinos in seven protected areas in India’s state of Assam by the year 2020. Five species of rhinos survive today: black, white, greater one-horned, Sumatran and Javan. In the last 200 years, the rhino population has plummeted from one million to fewer than 30,000 worldwide.